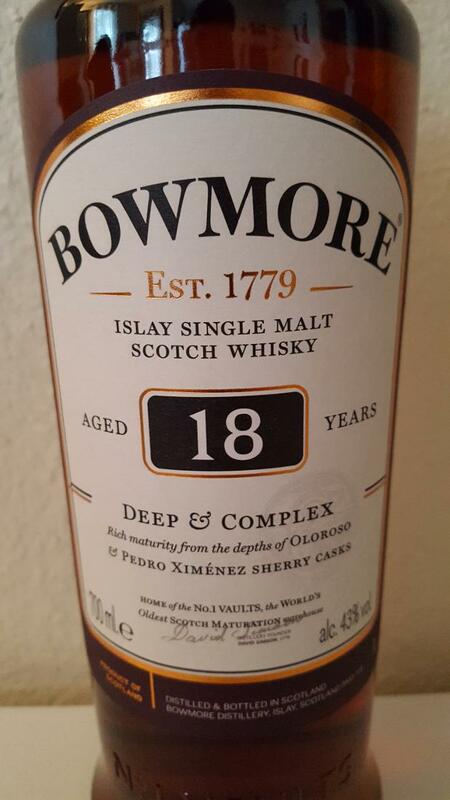 [June, 2017] Several years ago I had my last Bowmore 18-years old and found it rather weakish (83 points). So it is time for a re-taste and when I found this offer of two bottles for 99 Euro I could not resist. This review is on batch L172067. The colour is auburn and the texture shows very late slow legs and tears. The nose is quite winey and it seems to me that they added some wine cask maturations (Bordeaux or the like) to this batch. I like that! Besides this there are the typical sherry aromas (raisins, dark chocolate), toffee (from bourbon casks) and some peat smoke too. The taste confirms my guess of several different winey flavours (please keep this recipe, Bowmore!) and it is nicey balanced between the different wines, smoke and wood. And it is layered - a sign of great depth. The dram arrives warming and coating on the palate with a minor bitter feeling (tannins) that is not unpleasant. The finish is very long, sweet and neither bitter nor drying. But nicely chocolatey and chewable. Water is not needed as it flattens the dram. In a nutshell, this bottling is extremely tasty and tasty! Intensive sherry elements meet peat and sea, an interesting spicy note is the complete time dominant in the foreground. The oily creaminess of this bottling is impressive and although this malt shows many facets I miss the certain something or the certain "buzz" ;-). Still delicious and dangerous! The malt in the glass shines bright and clear. On the glass wall sticks an oily and syrupy streaks from the isolated thick drops dissolve which relatively quickly search their way back into the glass. The nose is initially very restrained, slowly dissolving dark berries and creamy dark chocolate. Mild peat flavors mingled with a hint of cold smoke, the peat is more mineral, but is always traversed by fruity sweetness. Velvety vineyard peach and abrasion of orange peel show up, the dark chocolate is noticeably more dominant, here and there the alcohol makes itself felt with a slight tickling in the nose. Echoes of salt and sea breeze reveal the origin of this malts, the fruit flavors become darker and more complex. A touch of dark caramel and a subtle spicy note stimulate the salivation. Dark fruits in combination with an interesting spicy note dominate the first sip. A wide variety of flavors flow through the palate, dried raisins, old orange, dark chocolate, echoes of various spices make the taste buds explode. Dark chocolate melts on the tongue, a sip of hot espresso is added before dark and wooden sharpness lays over the tongue. A pinch of salt revives the basic character of the maritime, creamy chocolate and red berries rest in the mouth. Old walnut aroma rises and exudes a slightly bitter aroma, creamy and oily wood elements float under the tongue. A combination of tart and sweet fruit elements, chocolate and spicy wood is accompanied by a slightly oriental spice mixture. Creamy and oily rest the now tart aromas on the palate. Subtle sharpness heats more and more on the palate and tongue. A few grains of salt and some crushed pepper provide a certain basic sharpness, cold espresso and bitter dark chocolate for discreetly bitter elements and the dark fruits with their sweetness for the sweeter influences in the aftertaste. Spicy wood tones and dark walnut aroma revive the creaminess and thus round off the harmonious finish. For a long time the savory aromas are warming on the palate, these aromas slowly fade away leaving a creamy mouthfeel. The aforementioned spice note or spice mixture never seems to end. Very similar to the regular 18-year-old, but there are differences: this one is even more leathery, sweeter and syrupy, thanks to the PX influence, which, sadly, is beginning to swamp the distillate here. It's also sharper than the standard 18, with a little bite in the finish. So both smoother and rougher, if you will. A bit vulgar perhaps, but still a good winter/fireplace/Christmas malt. Just after being poured into the glass, sherry is needed and we think of liquor blackberries. After a few minutes, the peat becomes stronger and stronger. It is woody, fruity, slightly medicinal. And also iodine, kelp. 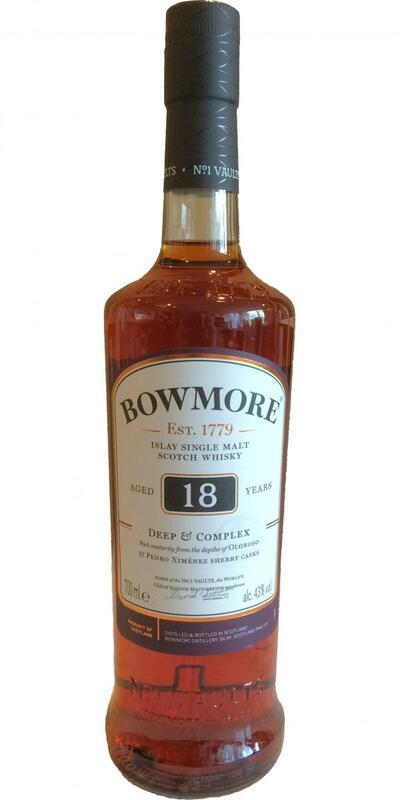 A delicately floral hue that is the Bowmore brand. Violet or rose. On the palate, it's a whirlwind of flavors, first of all, red fruit and soft leather, combined with a distinctive peat, then honey and candied lemon, something slightly acidic like gooseberry or red currant. the blueberry, spices, finally it's the final, long, the peat goes up and punches on the table, a touch of earth, the bousin, then the flowers that bloom in retro-olfaction, with woody reflections . If you have the opportunity to touch a bottle less than 80 euros, do not hesitate. A very neat, affordable OA standard. Easygoing, uncomplicated (but also harmless) Daily Dram. Dry smoke, ashes, black currants, toffee, leather. Phenolic notes. Some gum, musty and oily rags. Black currants, clearly ash, dry smoke and also white pepper. Sweetish, toffee. Middleweight, polished, finely tuned and harmonious-tasty. The aroma continues. Pretty tasty, but a little rough. Short-medium. These new Bowmores are very good, surpringly not thin at 43%. 86/87. Big sherry. Cranberry, orange peel, milk chocolate, salted minerals, piquant spices and smoke. Touch of camphor. Creamy. Dried fruits, citruses, spicy oak, smoke and peat.